Scottish fighter Lee McAllister has become the first lightweight champion to win a heavyweight title after boxing Danny Williams into retirement. Williams, a former two-time British and Commonwealth heavyweight champion, knocked out Mike Tyson 14 years ago. However, despite weighing nearly four stone more than McAllister, the 45-year-old was floored three times in the first five rounds in Aberdeen. His corner finally threw in the towel after 10 rounds at the Beach Ballroom. The win means that McAllister, who previously won titles at lightweight, light-welterweight and super-welterweight, adds the WBU heavyweight belt to his record. The 35-year-old fought at the 11-stone super-welterweight limit as recently as last year, before beating Lee Kellet on points over four rounds in his first fight at heavyweight three months ago. 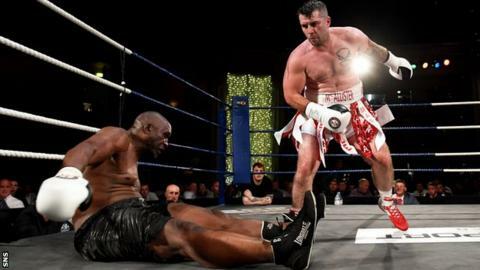 McAllister said before the fight that people thought he was "crazy" to take on the 6ft 3in, 19-stone Williams, who had won his last three fights by first-round knockout. He stepped up five divisions for the contest, which was eight divisions higher than the lightweight category in which he started his career.